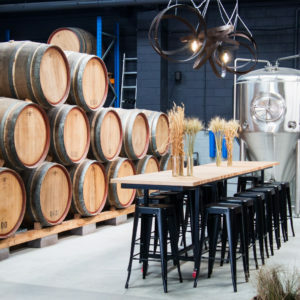 A brewing partnership formed at Boatrocker has led to Melbourne’s newest farmhouse-inspired, mixed-fermentation and barrel-ageing brewery and taproom. Reservoir’s Future Mountain Brewing and Blending was co-founded by Shane Ferguson and his partner Kara Rasmanis and Ian and his partner Elisa Jones, but the real pairing took place when Shane and Ian met over a mash paddle. “We were pretty much working together day in day out, side by side at Boatrocker,” Shane told Brews News. “Working on a brewery floor there’s a lot going on so you get to know a lot about a person. “Not only their work ethic but the more we talked the more we realised that we had a lot of things in common, not only with beer but with music and things like that, but also our vision for what would be a good brewery brand. “It was very sort of organic how it happened. “A lot of people who get into the brewing industry have some sort of dream or aspiration of opening their own brewery and yeah, Ian and I are both pretty driven personalities. It wasn’t long afterwards that the brewing couple decided to leave Boatrocker with visions of their own brewery. 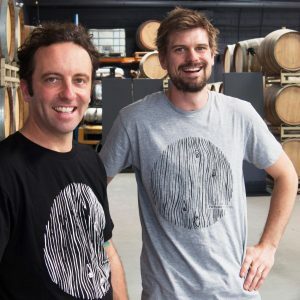 During the 12 months they searched for the right venue to appear, Ian went to work at Footscray’s Hop Nation and Shane went to Temple Brewing in Brunswick East. 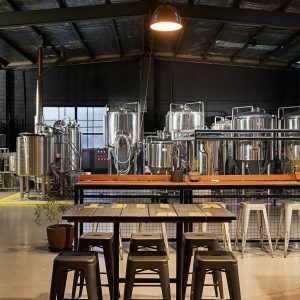 Shane and Ian secured a lease nine months ago and have just opened their 620-square-metre brewery and taproom. From the brewhouse at the back of the warehouse to the racked puncheons and barriques to the side, there is also an open fermentation room, sealed but still viewable to the public through a rectangular glass window. “On the stainless side we’re doing mostly farmhouse ales, so it’s saisons and different variations of saisons, it’s wits and traditional Belgian beers and we’re doing some pilsners as well,” Ian said. The Future Mountain brewhouse is 5hL with two 10hL tanks, two 20hL tanks and the open fermentation vessel can take another 10hL. “We worked on the size so it’s as versatile as possible,” Shane explained. A circular bar is located towards the front of the space with six taps on each side. Several of the venue’s tables were re-fashioned by Shane and Ian from the old wooden manholes used on some of Melbourne’s older tram models. Future Mountain’s barrels were crafted by a South Australian cooper. “Oak barrels, especially large format are perfect maturation vessels for Brett and bacteria so that’s really the job,” Ian told Brews News. The larger Puncheon barrels have been re-coopered and remain neutral so as not to impart any oak character to the beer. The smaller Barrique barrels have also been re-coopered but have been shaved on the inside to impart a lot more oak character to the beer. “In the puncheons, we’re not looking at picking up any oak characteristics at all,” Ian said. “Whereas the Barriques, they’ve been re-coopered but they’ve been shaved actually as well on the inside so you can pick up a lot of oak character in them. The blending process is governed in part by gravity, attenuation and pH but Ian and Shane agree that it’s mostly sensory. Shane said that it’s the blending and experimenting with yeasts that attracts them to this style of brewing. “The thing that appeals to us about brewing and beer styles that we’re drawn to is the traditional Belgian breweries of the day,” Shane explained. “They didn’t go to a lab and get their yeast, it was just regeneration from repitching and things like that. “If they had an issue with their yeast, if some of the beers didn’t start to attenuate the yeast, they would go and get a pitcher of yeast from a neighbouring brewery and effectively reinvigorate it,” Shane continued. “Some of the breweries that still exist now, certainly in areas in Belgium, whilst they all retain their own house culture, if you trace the lineage of the yeast back, there is a tie into a whole bunch of breweries. “We like that, that whole idea of Future Mountain as a brewery is basically that interplay between old world and new world, old techniques new techniques, old methods and new methods. “While we do get single lab strains of yeast… we will get two or three yeast strains from the lab and mix them together in a not scientific way at all, purely sensory, and pitch it. 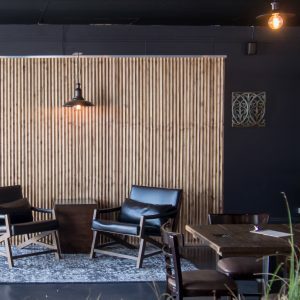 “Our idea on the barrel side as well as on the stainless side is eventually we will be able to take elements of the flavours that we like and basically keep on repitching them until we can establish something we can call a house culture. Shane said that Future Mountain is also experimenting with fruited beers. He said that they will be following the fruiting seasons rather than just focusing on the stone fruits of summer. When it comes to scaling the business and packaging their beers, Shane and Ian said that to start off with, they will continue to focus on brewpub sales and a serve-on-site business model. “Both Ian and I have experience working in production breweries and we’re certainly not approaching this from the point of view of going from a homebrewer to going onto a commercial scale without the understanding of quality control,” Shane said. “At all the previous breweries that we’ve worked at we were rigorously testing microbial things as well as DO and all of those factors. Both Shane and Ian agree that the brewpub is the best model to open with, for control purposes and the ability to test their products in real time with the consumer. No Future Mountain beers are yet in package but when they are ready the beers will be packaged in bottles between the 375ml, 500ml and 750ml formats, depending on style. The taproom is currently serving pies from local A1 Bakery in Brunswick. 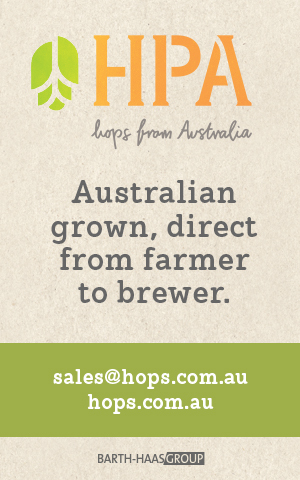 Future Mountain Brewing and Blending is located at 703-707 Plenty Road, Reservoir, VIC 3073.